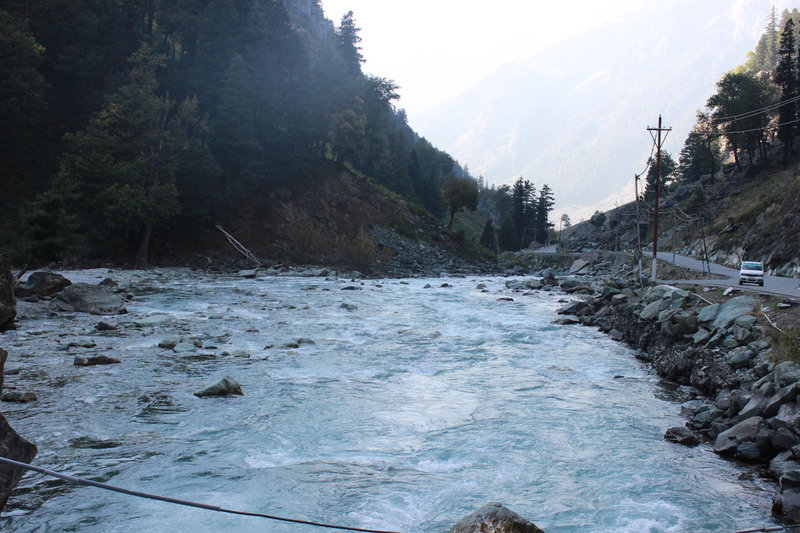 Sonemarg or Sonamarg means the valley of gold, and it is so as the locals say, that the hills shine in the night in moonlight. We did see some shine even in day light. 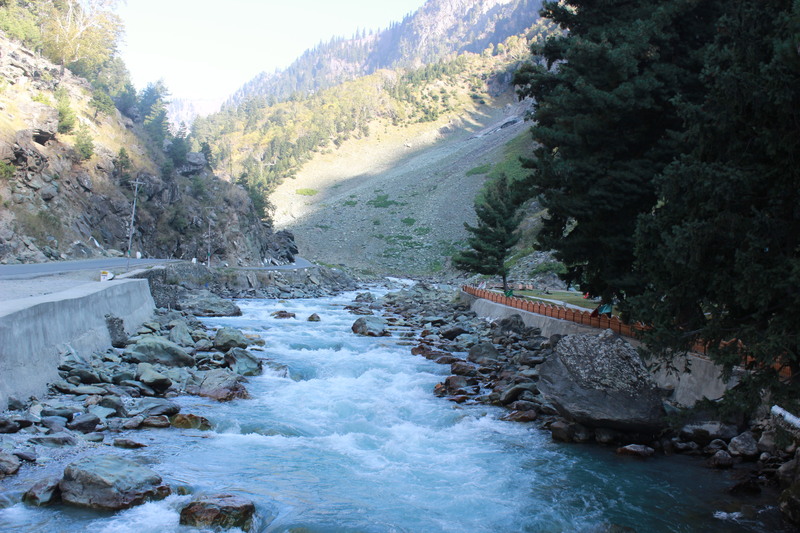 Sonemarg is located about 87 km northwest of Srinagar at the banks of Sindh river. 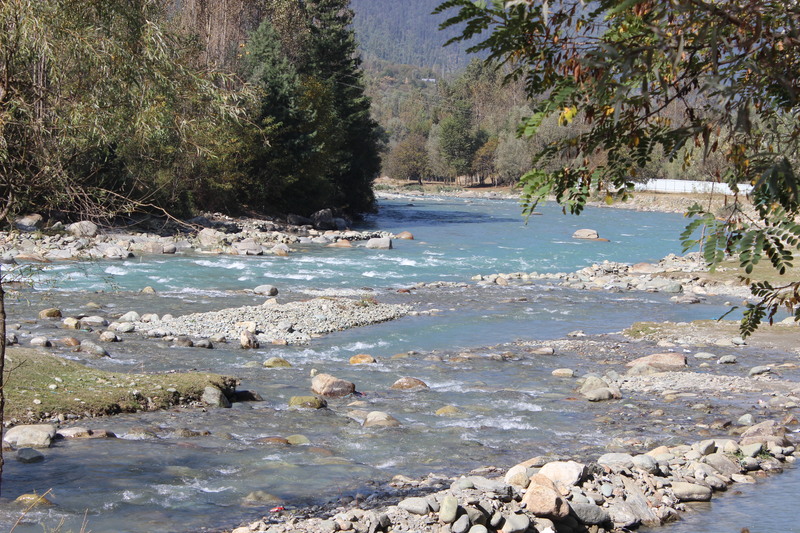 The river is magnificent and I will put some pictures of it soon in this post. 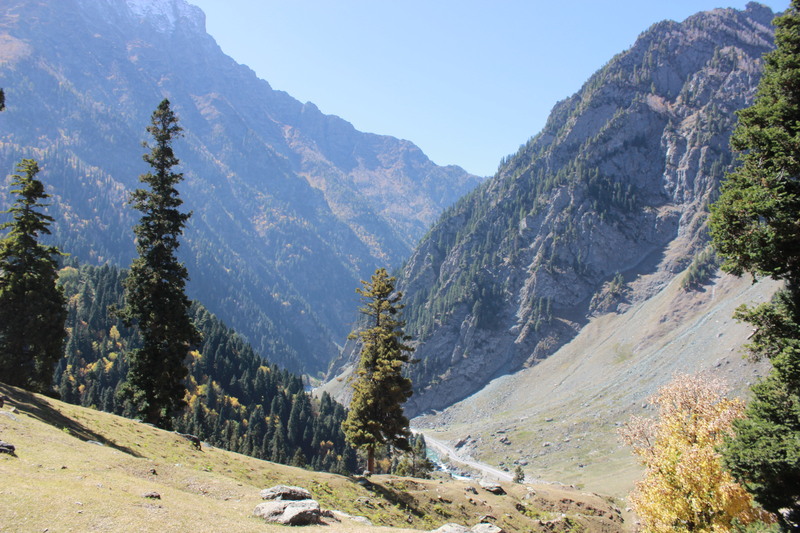 Sonamarg is located in the Ganderbal district of Jammu and Kashmir state and is at an altitude of 9186 feet above sea level. 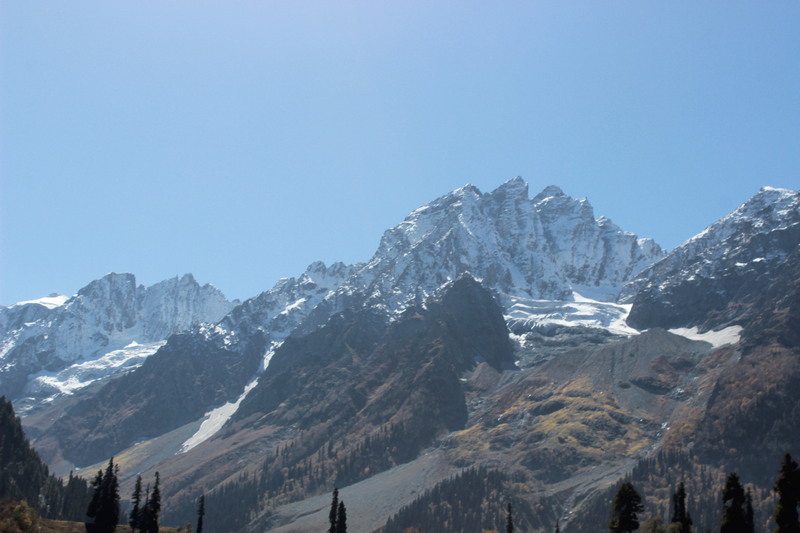 It is on the way to Kargil and Ladhakh via the Zojila pass, and does not have any permanent settlement around due to heavy snowfall in winter and avalanches and is inaccessible during winter. 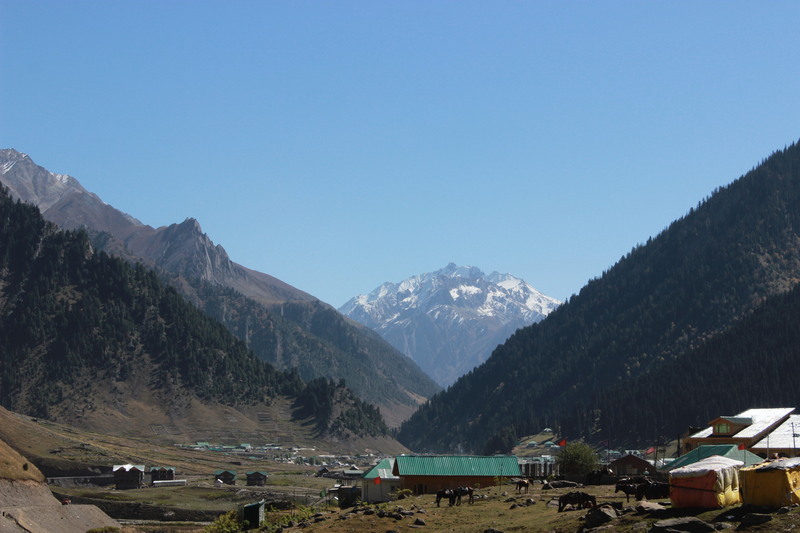 Only the Indian Army personnel are the ones who stay at Sonemarg during winter at the army camp due to proximity to sensitive zones. 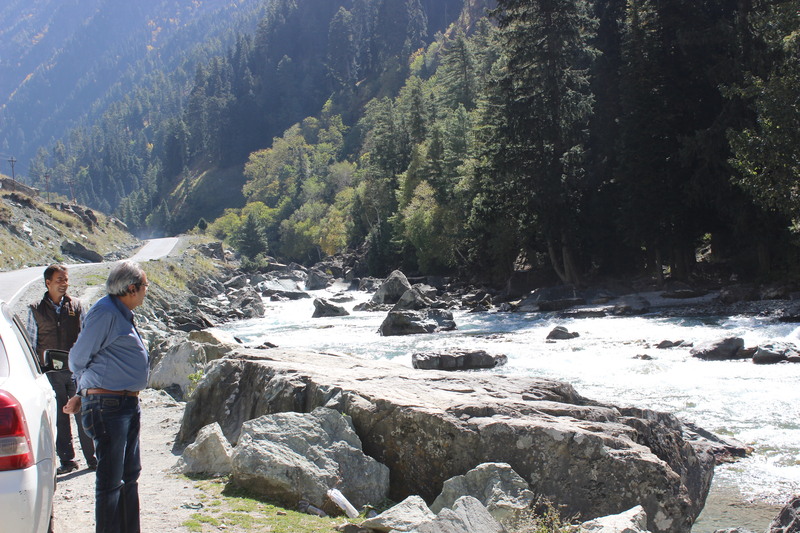 We started early for Sonamarg so that we could return to Srinagar on the same day. 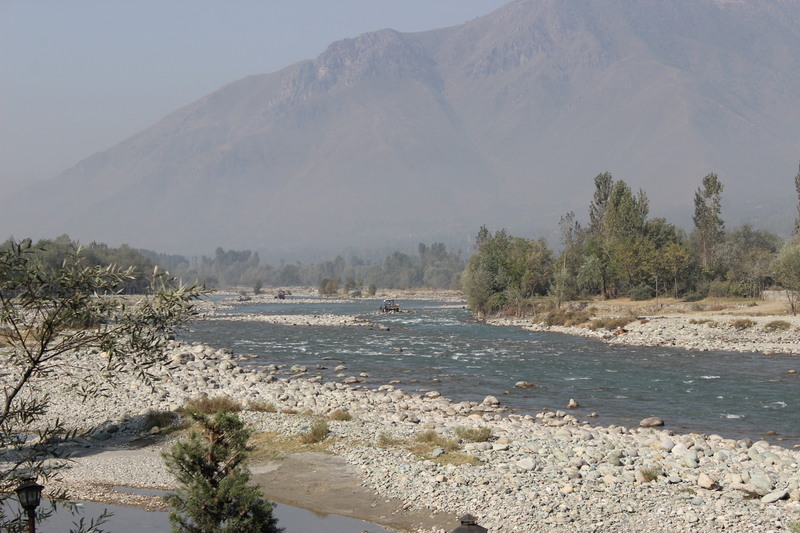 Our first encounter with the Nalla Sindh or the Sindh river was at a dhaba (roadside eatery) on the way. 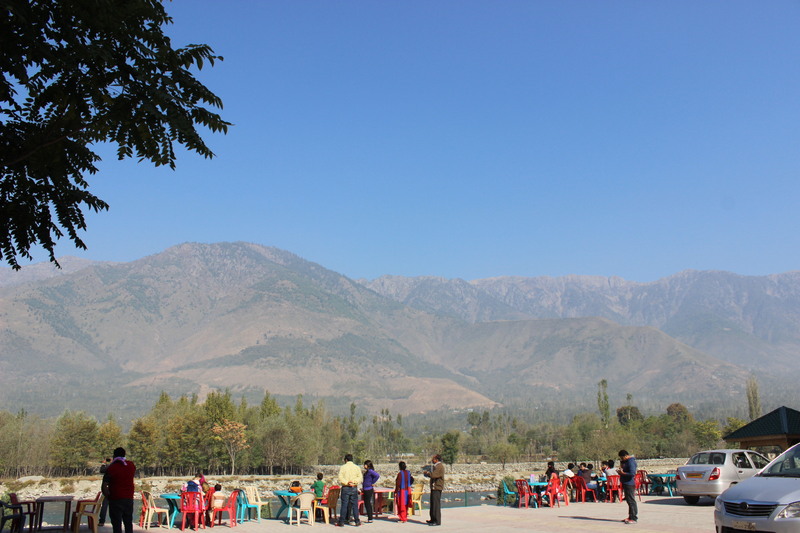 the dhaba were people were eating without noticing the river!! Our driver Razzakbhai wanted to have some tea here. One thing would be interesting to know that most Kashmiris have only salted tea called Noon Chai (salted tea with special tea leaves and other spices and has an elaborate preparation) for breakfast with traditional Kashmiri breads. 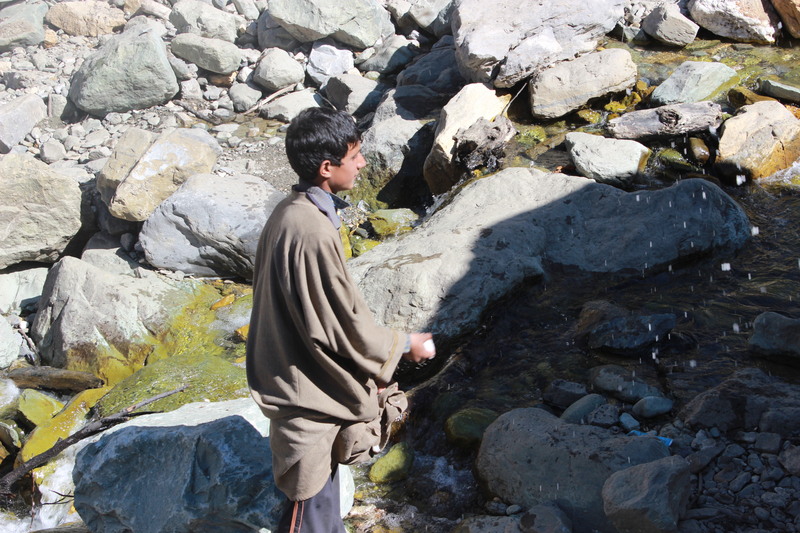 Most of them told us that at least twice a day “Noon Chai” is a must for them. On the other hand, a sweetened sans milk tea concoction called Kahwah (most of the time pronounced as “kehwa” by the locals) is also served to people (specially non kashmiri people) which also has many ingredients, significant among them are almonds and other spices. This helps you to keep warm in cold weather. However, Razzakbhai also stopped here as this place (like most other) doubles up as an emporium, shop for handicrafts, etc. and just in case we wanted to buy something. Now, this was a common part of the trip for us, to stop at various places recommended by the driver for tea, but actually they were either emporiums for handicrafts or materials or other stuff. Usually they get handsome commission. 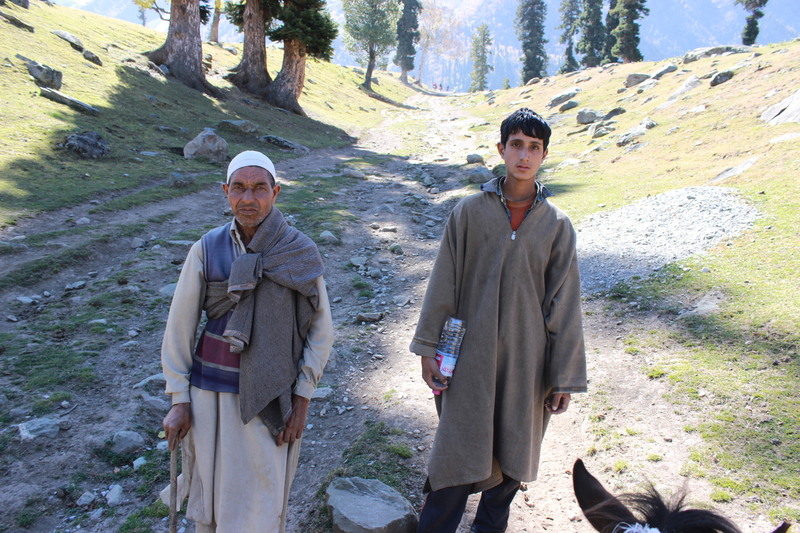 My Kashmiri Abbu told me that the commission is as much as forty percent for some of them. We did not buy (as we were strictly instructed to by my Kashmiri Abbu) but it also earned us a bit of ire from Razzakbhai. 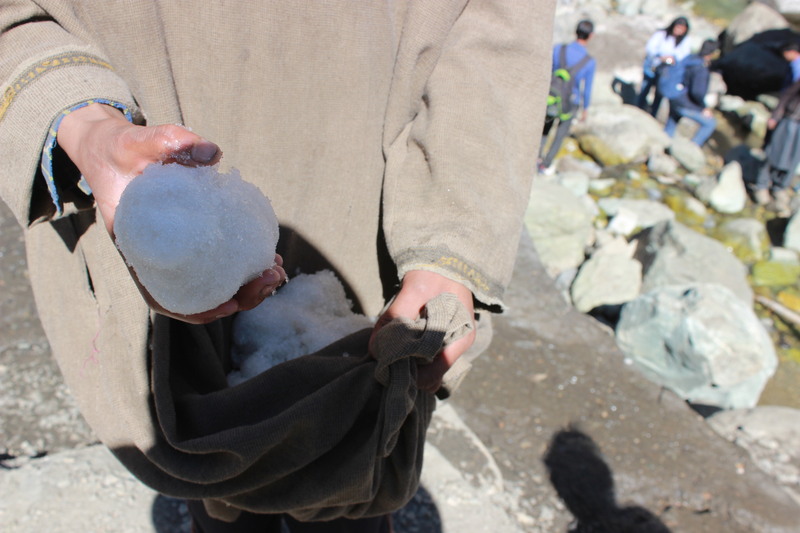 However, he remained is soft spoken, polite Kashmiri self throughout the journey and was a good support to us. We understood how he felt as the entire valley is almost completely tourist dependent and one has to appreciate that reality. 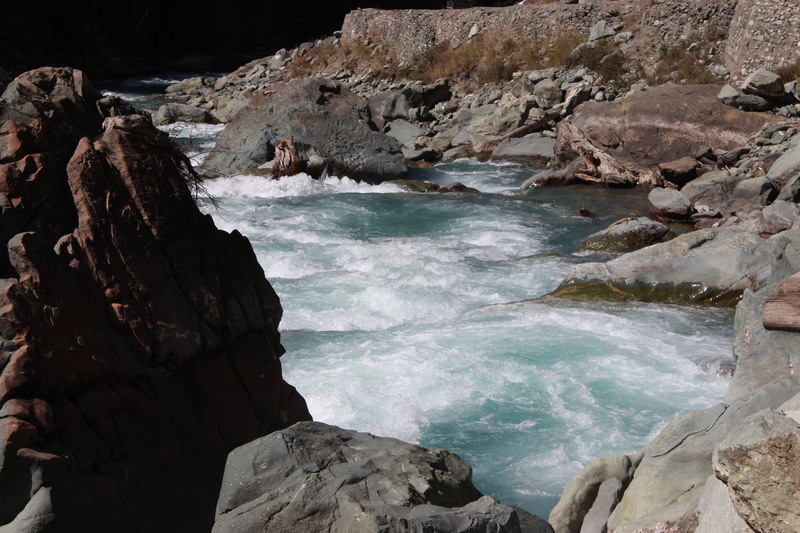 we could not have enough of this river. 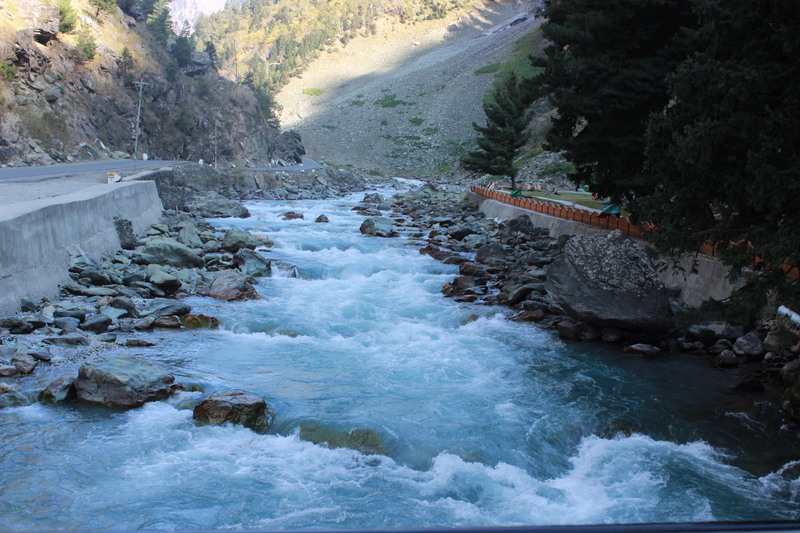 and to think that this flows to both India and Pakistan was thrilling. slowly the landscape started changing. the greenery became scant, came the sombre grey mountains and the road became a bit narrower. The wind became cooler than Srinagar. 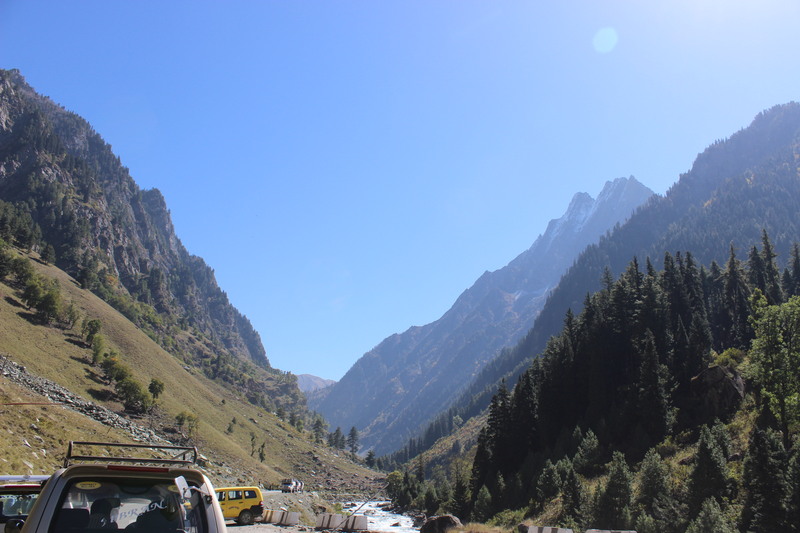 The highway or National Highway 1D (I found it interesting that it is called 1D) has the mountains all along on both sides with Nalla Sindh on the right hand side (on your way to Sonemarg) dancing all the way. 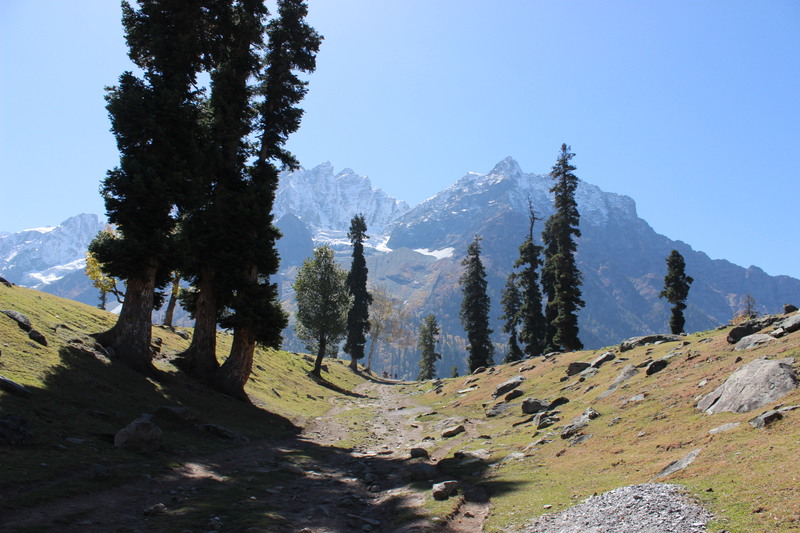 And then, we reached Sonemarg or Sonamarg, the golden meadows. the best time to come here is actually March/April where you could still get the snow. October was almost the onset of winter and one gets only what is left after the summer has gone away. 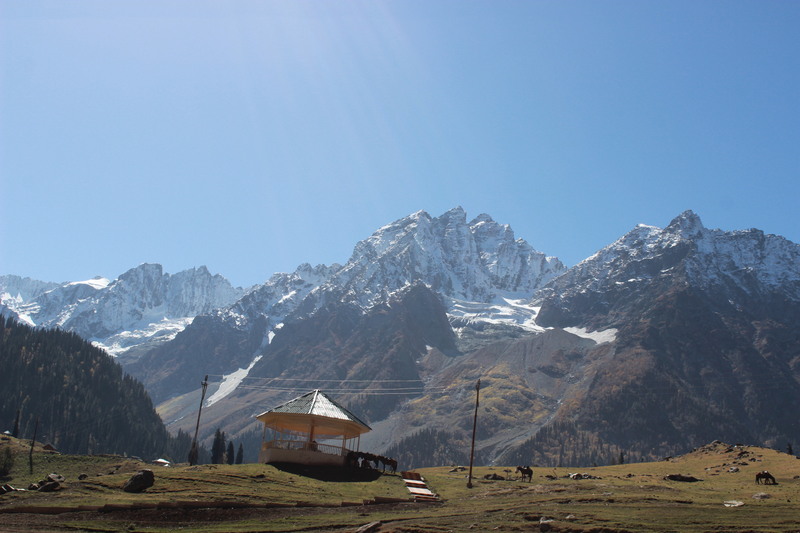 Sonemarg awed me at first sight, imposing mountains with little or no greenery and the glaciers at the yonder. what a sight! 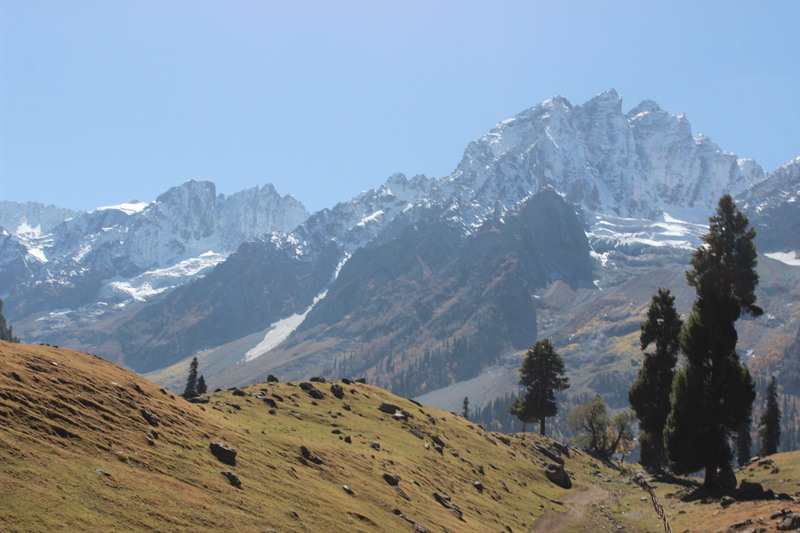 Sonemarg has many Himalayan glaciers in its vicinity, two main being Kolhoi and Machoi glacier and some peaks that as as high or more than 16000 feet high such as Sirbal Peak, Kolhoi Peak, Amarnath Peak and Mahcoi Peak. 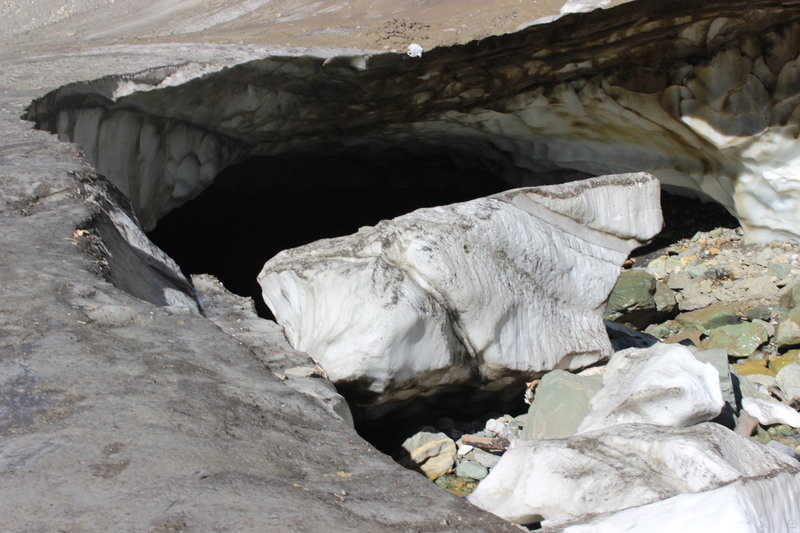 the popular tourist attraction is the Thajiwas glacier which is completely covered in snow most of the year except for September and October. Thajiwas glacier is about 3 KM from where the taxi left us and we decided to hire ponies to get there. If you are fit enough, I would advise that you trek there. It is not at all easy to sit on a pony or a horse in this region as the road is very uneven and riding a pony is taxing on the body. I definitely felt it for myself. 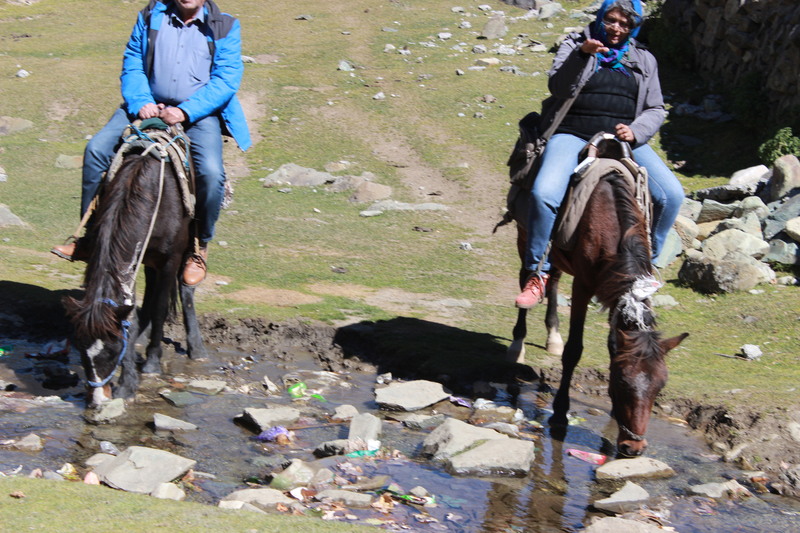 More on horse or pony ride when I write about Gulmarg. our ponies drinking water. yes, it was that cold in Sonemarg though in Srinagar we did not even need a jacket or a sweater during the day. 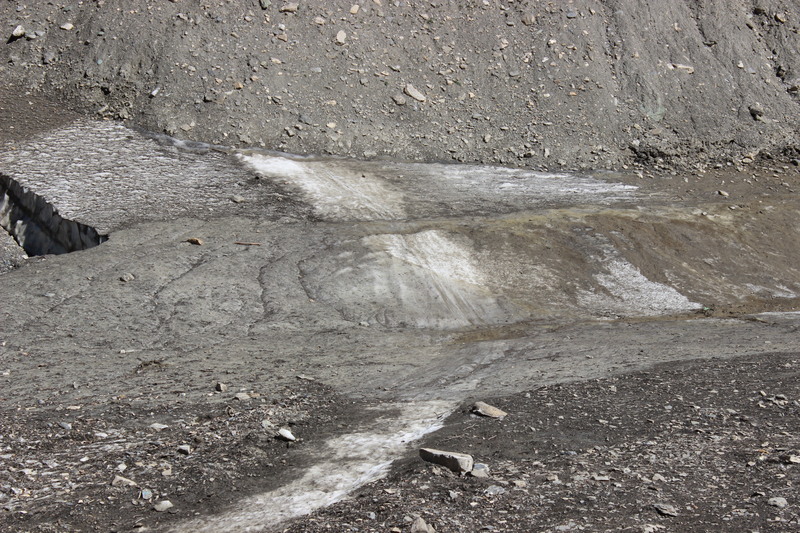 The road to Thajiwas glacier was uneven and was a sharp incline. Here one thing to note is that one has to really bargain with the ponywallas. On the other hand (my opinion) since you are visiting a place where people can earn only for about 7 months (march/april to september), why not pay them a bit extra. They are very hard working people and walking with your pony uphill on such sharp incline and difficult terrain is not an easy job, even if they are local and are used to it. 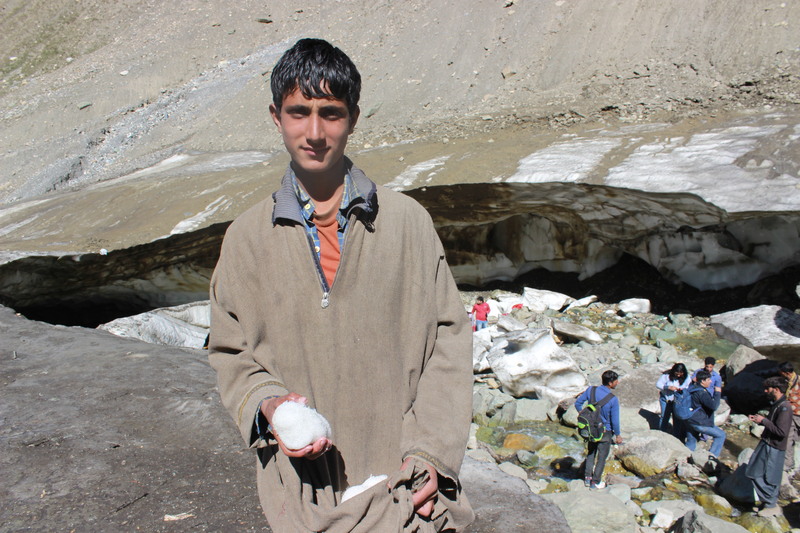 The Thajiwas glacier did not have much ice but Ibrahim was adament. 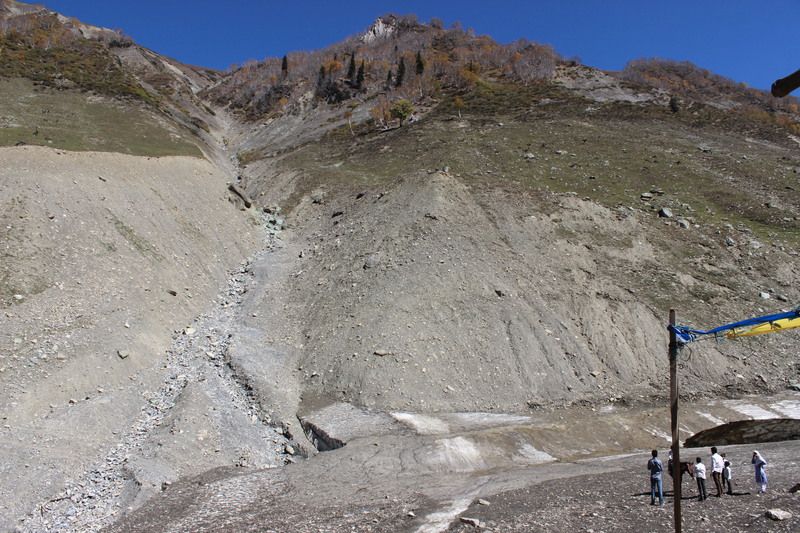 He had to take me to another glacier which was even further away and even higher. As we climbed and climbed endlessly, I noticed there were no one else who were coming behind us, except the older pony man and Ibrahim. 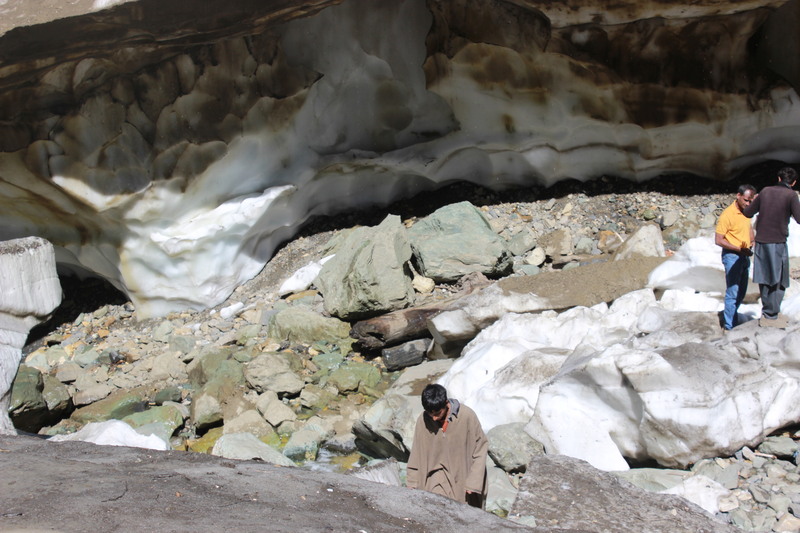 I wondered where we were going and Ibrahim kept assuring me that all would be well when I reached the ice. we just kept going on this path and it seemed endless …. by this time I had given my camera to Ibrahim and he kept taking pictures. Their picture was taken by me. every now and then, Ibrahim would tell me that we would reach the destination in five minutes. In reality it took us about an hour and a half to reach the glacier where he took us, but unfortunately i cannot remember the name now. It was beyond Thajiwas. We finally reached some place, just when I was about to give up. 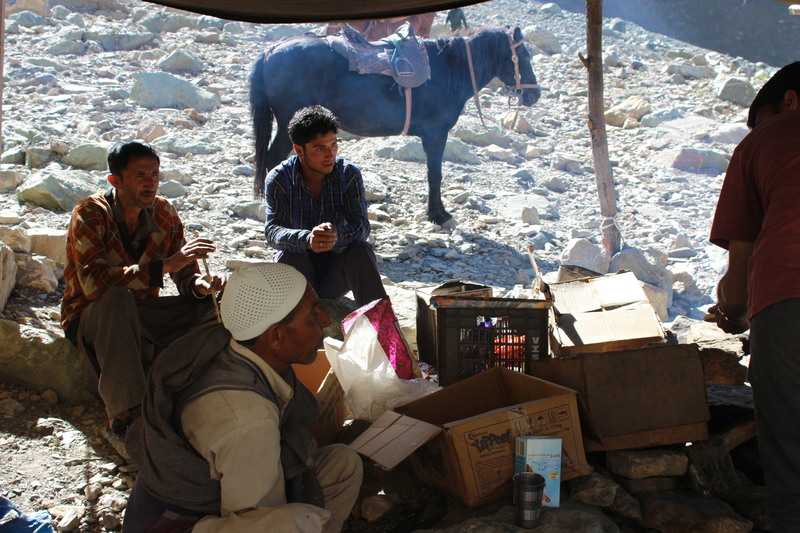 This place had a tea stall with some plastic sheet for cover and some stone slabs as seats. However, when we reached there, we realised there were many others who had reached there before us and many who came after us. so it was not such a difficult place to climb after all since people of all shapes and sizes came along, on pony mostly. The view was both gorgeous and awe inspiring. We were surrounded by mountains that were stark, either naked or with ice and very little vegetation and completely and absolutely silent. The afternoon sun which was burning my face on the way up, seemed to have shrunk a bit in front of this majestic presence. It was awesome. 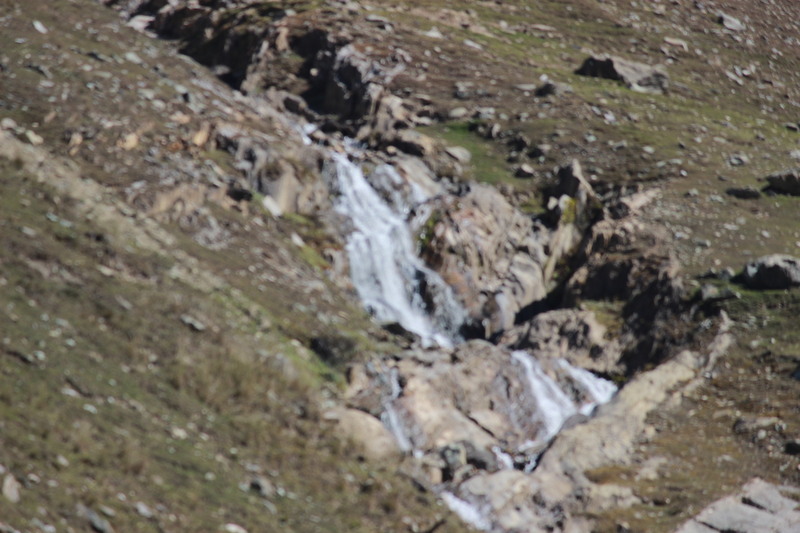 I could spot a stream coming down from another glacier further away from us and took some pictures but they have not come very well, though I used telephoto lens. 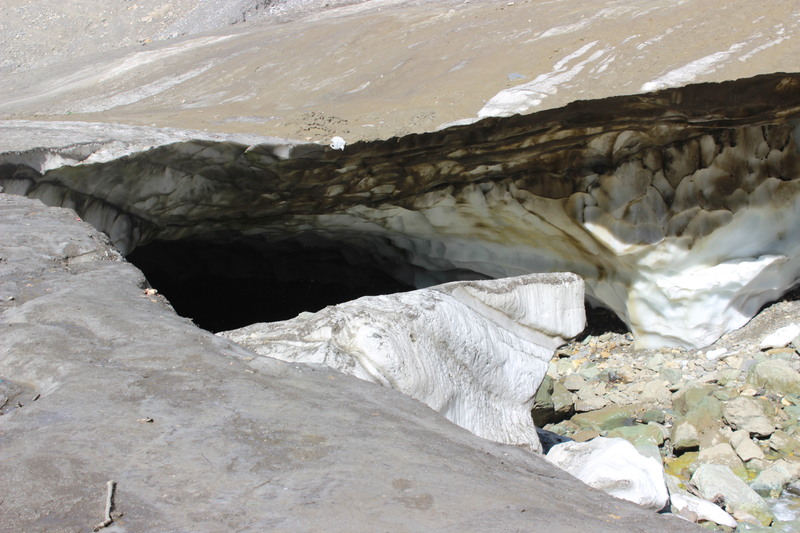 This was the glacier Ibrahim brought us. 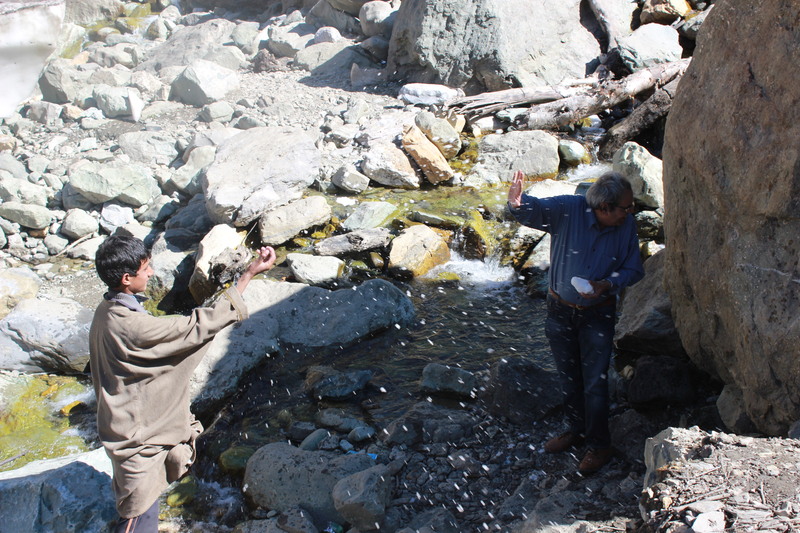 He would later go down (will show you pic) to get ice for us as I refused to go down further. we had tea here. The tea man comes early morning, walks for an hour to come here ( I could not believe my ears) and then goes down by 4 pm and dismantles everything only to set them up the next morning again. and encouraged us to play with by throwing the ice at us. He was such a sweet boy. 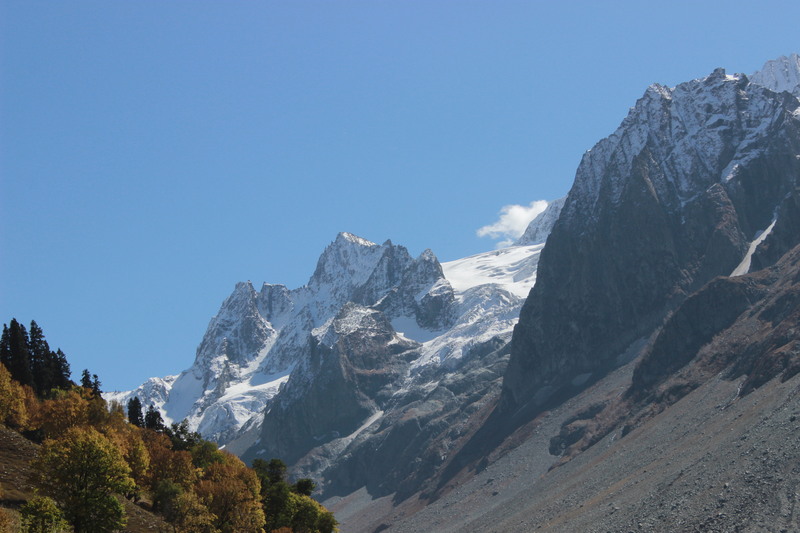 It was time for us to come back to the highway and say good bye to the glaciers. We thanked both of them and paid them more than what was agreed and I still felt that it was less. Anyway, however idealistic or foolishly romantic one was, I had to reconcile that hardship of this kind was a part and parcel of their lives. 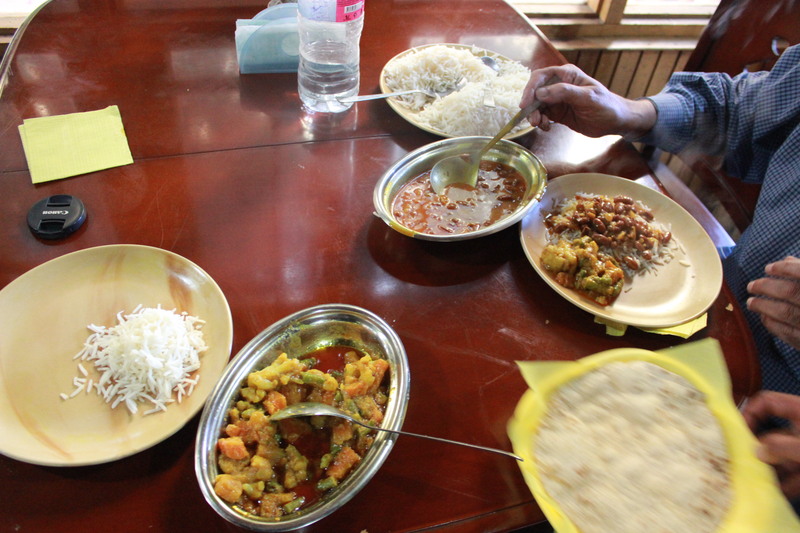 On the way back, we had some lunch at a J&K tourist restaurant by the side of Sindh river. 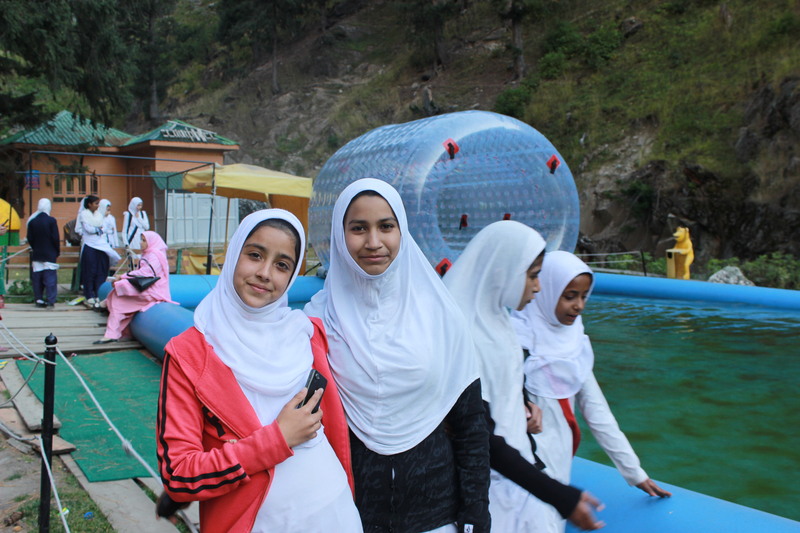 there were many school girls who had come from Srinagar for picnic and wanted me to take their picture. It was time to good bye to lovely Sindh and beautiful Sonemarg.